What health stories should we report on? Good health matters. So does good health reporting. What health-related stories should KPCC report on, and how are you involved in those issues? Are you a health-care worker or a family caregiver? 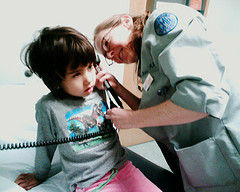 What questions do you have about the new federal health care law? Are you involved in some new type of medical care? Be a news source for KPCC by telling us what health issues matter most to you, and where we should go to report those stories. Your responses are confidential. Nothing you share will be aired or published without your permission, so please let us know what health topics are on your mind. It helps to shape the news you hear on KPCC.